Home cataracts early balding health rules low eye pressure muscular degeneration muscular dystrophy myotonic dystrophy symptoms Muscle Degeneration: Don't Ignore 8 Early Symptoms! Muscle Degeneration: Don't Ignore 8 Early Symptoms! caused by a gene mutation and it leads to progressive damage and a loss of muscle cells in your body. It includes over 150 types of degenerative muscle diseases that act in different ways. But almost all of them begin with some mild symptoms that if left unnoticed slowly progress with time. This article will tell you about eight main symptoms of this serious health condition. As a bonus, you'll get to know. What you should do to treat muscular dystrophy? # 8 Pain and stiffness in muscles. The loss of muscle cells usually causes a feeling of weakness in your muscles. So, if you have problems when rising from a chair, brushing your hair, lifting an object or you constantly drop things to the floor. You might suffer from muscular dystrophy. You may also notice contracture reduce, flexibility, and frequent muscle pain. 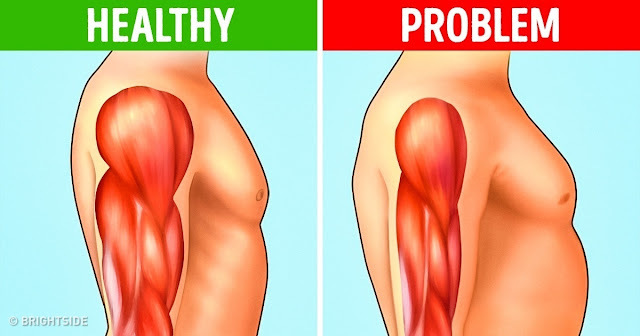 These are indicators that something may be wrong with your muscles. Along with those symptoms such as prolonged, spasms and the stiffening and tightening of arm and leg muscles, may be signs of myotonia. This is a serious condition that requires medical treatment. Enlarged calf muscles may be one of the signs of ducaine muscular dystrophy. This disease usually occurs at an early age in boys and worsens very quickly. Muscle loss usually starts in the pelvic region and upper legs. After that, this condition affects the upper arms. As a result, many patients have difficulty standing. If you suffer from ducaine syndrome, your calf muscles are often affected first because they are used a lot when you try to stabilize your body. In this case, they start to look disproportionately large. After some time the original muscles get replaced by fat and scar tissue. which causes the internal organs to change their position. Scoliosis usually presents itself in teenagers and is more often diagnosed in females than in males. rib deformity, chronic fatigue, shortness of breath, mood swings, and digestive problems. increased risk of serious respiratory infections. If not treated properly a simple coal can quickly progress to pneumonia. #4 Difficulties with speech, chewing and swallowing. If a person has eating problems such as being unable to chew food or swallow it. Coughing, choking or a muffled voice after they've eaten. These may be the first signs of Kennedy's disease. Its other name is Spinal and Bulbar Muscular Atrophy. This progressive disorder typically leads to muscle cramps and weakness because the motor neurons in the spinal cord and brain stem undergo degeneration. The disease may present itself at any age but it most commonly develops in middle adult life. occur. These changes are called cardiomyopathy. If a person has this problem the muscles of their heart are affected. There may be no symptoms of Cardiomyopathy at an early age. Although some people experience shortness of breath, tiredness or leg swelling. Even though such signs aren't exactly telling. They still indicate the presence of the disease. Due to this disorder, your heart can't work as perfectly as it's supposed to. Therefore, you might experience an irregular heartbeat which often leads to fainting and dizziness. The worst thing about Cardiomyopathy is the high risk of instant cardiac death. A cataract is the most common sign of muscular dystrophy and it can be explained as a clouding of the lens inside your eye. This disease typically leads to blurry vision, faded colors, trouble with bright lights, and night vision problems. People affected by cataracts are at high risk of Falls as well as depression. They have problems with reading, driving, watching TV, working at a computer, and recognizing faces. Cataracts are the cause of 33% of vision loss and about 50% of blindness all over the world. #1 Balding and male infertility. typically causes early balding in the front part of a man's scalp and this often develops during their 20s or 30s. The endocrine disorder may also cause impotence and testicular atrophy in men. As a rule, this condition leads to infertility or the inability to have children. Bonus: How to treat muscular dystrophy. Although there is no actual cure for muscular degeneration. You can still do some simple things to keep your muscles strong and healthy. stretching will help you stimulate your body and build muscles naturally. Try some aerobic exercise to increase your heart rate. Make sure you can hold a conversation while you're training don't overexert yourself. It would be perfect if you manage to do a 20-minute training session four to six times a week. If this seems too hard, start by exercising for 10 minutes a day and gradually increase the length of the training. You can also do some strength exercises. In this case, you should follow a high repetition and lightweight regimen. Eat more foods that are rich in vitamins E and D. If you suffer from muscular weakness, eat more salmon, sardine, shrimp, cheese, eggs, almonds, avocados, broccoli, and olive oil. According to research conducted at the Medical College of Georgia at Georgia Regents University in 2015 "vitamin E helps to build strong muscles". Use turmeric powder when cooking. This Indian spice contains a powerful compound called curcumin. Which may be useful in preventing and treating muscle wasting. Drink green tea instead of other beverages. According to a study published in the American Journal of Clinical Nutrition in 2002. Drinking about seven cups of green tea per day may help slow down the deterioration of muscle tissue, by combating oxidative stress in your muscles. Add baking soda to your bath. Thanks to its alkaline nature this substance can protect your muscles and remove aches pains and inflammation. In any case, if you've noticed any of the symptoms mentioned in this article, the first thing you should do is see your doctor do you visit a specialist. If you notice unusual symptoms you didn't have before or do you tend to say it'll go away on its own? Share your thoughts in the comments below. Amazing blog post,The general population who carry on with an existence with second thoughts and strain can't carry on with a solid life and it isn't useful for the wellbeing and in this circumstance might be your family and companions feel dismal but you can get best ideas for best work. As a human, we as a whole completed an oversight and take the wrong choice however we should bear every one of the inconveniences and endeavor to be unwind. Thanks for sharing such type post,In this post, I can see the supporter of the Donald trump and makes wants for the great expectation but you can get follow the link for best work. They imagine that Donald trump would progress toward becoming can work uninhibitedly and appropriately for the nation and individuals of the nation. However, the post is great and fascinating. Amazing blog post,Individuals need appropriate climate which isn't cold and not all that warm but you can visit http://www.residencylor.com/residency-application-services/residency-letter-of-intent/ to manage your task. At the point when the winter comes the climate turns out to be so cold and individuals restricted to their homes and each sort of the action are halted and when the late spring season begin climate turns out to be so warm.